We specialize in Orthodontics. Braces are used to assist in aligning and straightening teeth in order to not only improve appearance, but improve a person’s bite. Having braces isn’t just about improving your smile, but it’s also about improving your overall dental health. Orthodontics may be used to correct several different malocclusions including overbite, underbite, cross bites, deep bites, crooked teeth and other flaws of the teeth and jaws. Braces may be used in conjunction with other orthodontic appliances to help with making corrections to a person’s bite. Dental technology has improved tremendously over the years to include new options to help correct the above issues, and there are a number of techniques and products available that were not available just a few short years ago. The patient experience has improved and today’s options are less conspicuous than the full braces that were common in the past. Your first visit will begin with a consultation with the doctor to go over the best alternatives for your orthodontic care. The doctor will address any questions you may have regarding your treatment and will provide a plan for orthodontic therapy and discuss your options with you. These braces are popular with adults and teenagers who want the results of braces without the look of metal. These braces have some advantages over traditional metal braces. The primary difference is that they do not use elastics or metal ties to connect the archwire to the brackets. 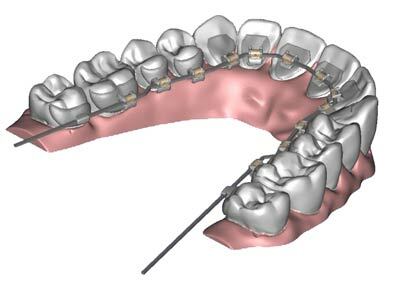 There are several potential benefits to choosing self-ligating brackets if it is determined that they are a good option for your treatment.Aesthetics – Brackets may appear smaller than traditional brackets. Cleaning – The absence of elastics and ties can make these braces easier to clean than traditional braces although special care to daily cleaning and maintenance is important with any type of orthodontic treatment. Time – Adjustment appointments are often shorter with this efficient system and overall treatment time can sometimes be reduced compared to traditional orthodontic treatments. Aligners are clear, thin, plastic-like trays that are formed to fit an individual’s teeth. Patients are responsible for putting in and removing their aligners. A series of aligners are created to move teeth. Each aligner is worn for 2-3 weeks, and moves teeth a fraction of a millimeter at a time. Patients must remove aligners for meals and when brushing/flossing. The number of aligners needed to correct misaligned teeth varies based on the individual’s orthodontic problem. The aligners are customized to apply pressure to the teeth that you want to move. Clear aligners show off your smile so most people won’t even notice you are wearing them. They are easy to remove and there are no wires to trap food. These braces are still the most popular types of braces as they produce high quality results. They are small, comfortable and great for kids because they are the easiest to care for.